A delicious way to add more vegetables to your daily meals is juicing. If you don’t like eating beets, beet juice is a tasty method to get beets into your daily regimen. Raw beets are sweet right out of the ground and need little decoration. But, their explosive flavor is too much of a good thing if taken alone. Many people have adverse reaction to juices made from just root vegetables. Always combine beets with other veggies, fruits or berries. You can juice the prized roots with the leaves as long as they are perky and fresh. The roots are a good source of calcium, potassium, and iron, while the greens are rich in calcium, iron, and vitamins A and C.
Never consume beet juice alone, because it can cause an inflammation of the throat and esophagus. No juice should ever be more than 50% beet juice. Juicers are capable of turning practically any fruit or vegetable into juice. A juicer separates the juice from the fiber of the vegetables yielding more juice than blenders, and with tastier results. Blenders and food processors do not separate the juice from the pulp. They puree the ingredients into a thick liquefied mixture that you’ll need to filter if you are making a juice, and not a soup. Blenders work fine if you don’t have a juicer, but with either appliance always follow manufacturer’s instructions. 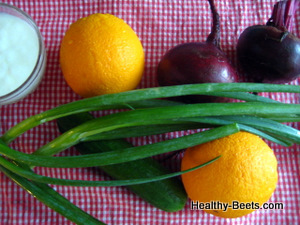 Beets combine well with carrots, grapes and apples. Enjoy an amazing ruby color in a strawberry-beet juice combination. Replicate a world-renowned beet soup in a blended drink. Or, start experimenting yourself with different flavor combinations to increase your repertoire of options to suit your personal taste. The only trouble in making new combinations is not to whirl more and more weird and intricate mixtures, some of them becoming quite undrinkable. Think about colors as well as flavors – you want a juice to have a pleasing hue. Hot flavors should be balanced by mild, and sweet by sour. Choose small to medium beets for your juice blends, and look for those with fresh looking greens. When you get them home, store beets and greens separately. Use the greens within two days, but refrigerate the beets themselves in a plastic bag for up to two weeks. Scrub the beets, and other root vegetables, thoroughly -- after all, they did come out of the dirt! Rinse the beet greens in a bowl of cold water. Cut beets into 2-inch pieces, or follow manufacturer’s directions included with your juicer. You can extract 6 to 7 ounces of juice from a pound of either beets or beet greens. Beet, Carrot, Orange and Apple - get all the benefits from a combination of iron rich beets and vitamin packed carrots and oranges. Beet-Carrot- Grape and Strawberry-Beet Juice – delicious nourishing beverages you can make in a blender or electric juice extractor. Beet with Apple and Ginger – ruby-red refreshing drink with added spiciness of ginger. Vegetable juice – beet borscht in a glass – with cucumbers and oranges. Ginger and Mint Beet vegetable juice – new ideas for your juice fasting days. Fresh juices don’t keep well, so plan to drink them within a day or so. Serve chilled or pored over ice. If the juice seems too thick, dilute it with a little cold water. If the gray color results, stir in lemon juice a little at a time and serve immediately since the clear color may not last long.